Mac's Reese made a good impression at our GAGC Fall Event when Shari and Russ met her, their boy MO approved of her as well. They adopted MO the end of July and felt he needed a friend. The family went home and made the decision they wanted to adopt her. Russ liked that she is from the same breeder that Mo came from and have the same dad. 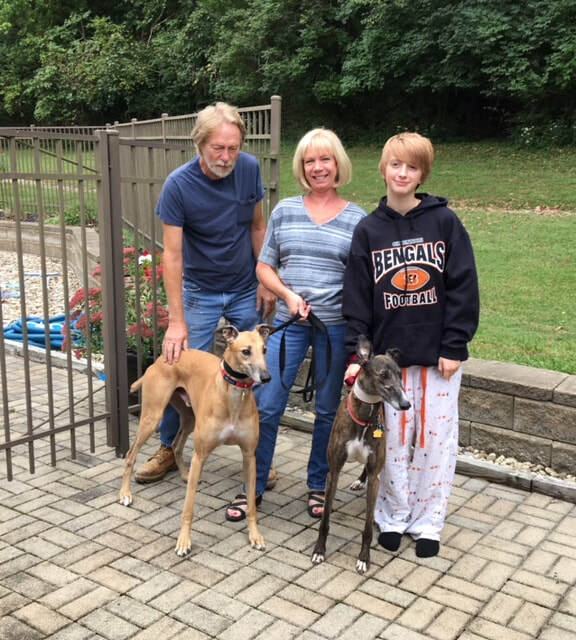 Reese did fine with the two cats, Muraco and Lulu and seemed especially happy when she saw the toys she'll soon call her own at her forever home in Harrison. Pictured also is their grandaughter, Emma, who seemed thrilled to be there for the adoption of greyhound #2.